I’m a lucky girl! These were delivered via bike messenger to my house! I should add that I live at the top of a very steep hill. I felt a little bad for the delivery person (Ian), but he said it was all in a day’s work (as he wiped some sweat from his brow). And just like that, he was off to deliver the rest of the flowers that were in his basket. I love everything about Farmgirl. 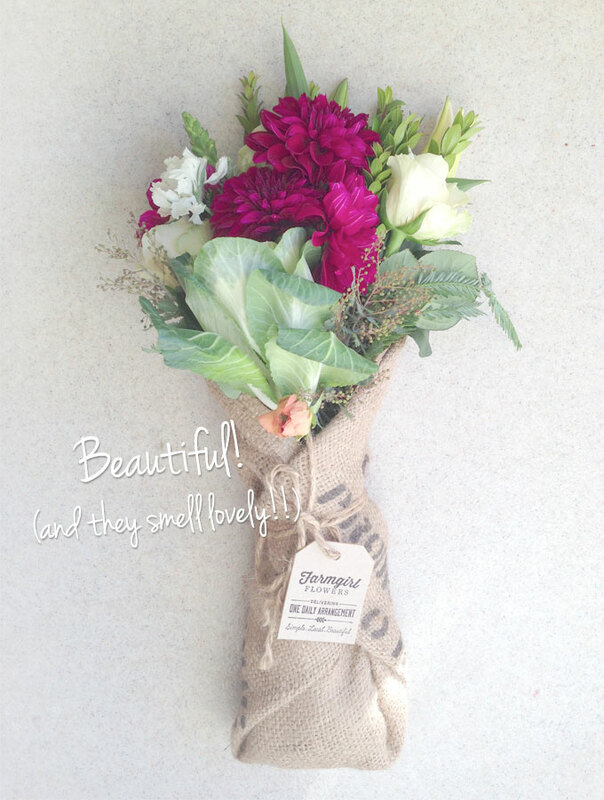 Farmgirl is kicking imported flower companies to the curb. 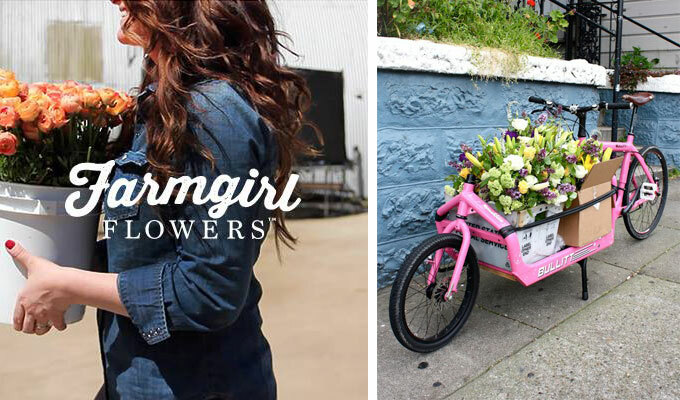 In addition to buying locally grown flowers, they are partnering with Cupid Couriers, a San Francisco worker-owned bike courier company. They deliver flowers via pedal power whenever possible in San Francisco. And if they can make it up my hill, they can pretty much deliver anywhere. It gets even better – they also use reused or re-purposed vases and make a donation to Playworks for every arrangement ordered without a vase. 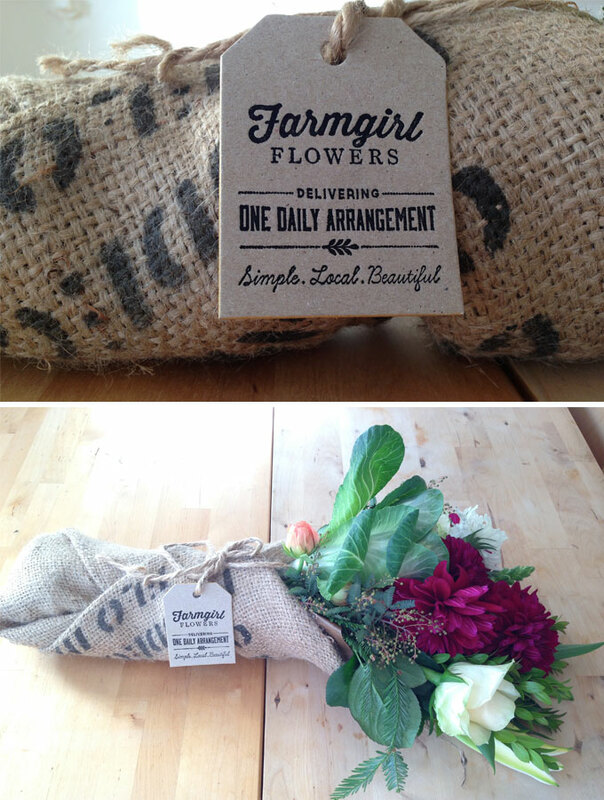 If you are going to have flowers delivered in San Francisco, the choice is pretty clear – Farmgirl flowers! You can also follow them on Facebook here. This was such a difficult project! I had to drink copious amounts of inexpensive plonk so that I could use the corks. Not exactly true but it does sound fun in an odd way. Last year, I scavenged many succulents from my son-in-law and daughter’s San Francisco garden. There were so many varieties, I knew I had to take a lot since I live in the dry lower Sierra to see what would grow and what wouldn’t. Surprisingly, everything adjusted to the climate and now I have my own bounty of succulents. This year, I’m making little holiday gifts for dear friends. I have decided to combine the succulents with wine corks. I’ve seen these little gems all over the internet so it’s not an original creative idea of my own (just working with what I have in the garden). I must admit, I really think they are precious …recycle, reuse and give! -I placed moist earth from the garden and the clippings from the acquired SF cuttings. -I pushed the soil down with a long nail to the bottom of the hole in the cork. 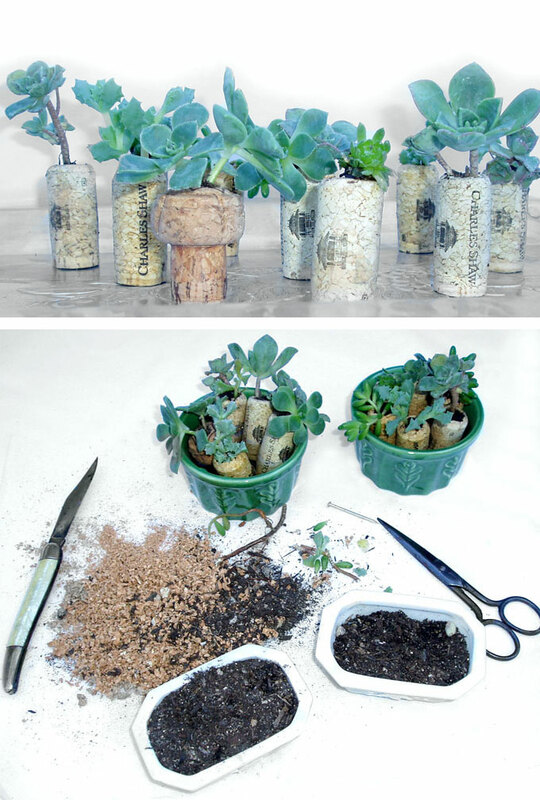 -After I inserted the cuttings and earth, I put the corks in a bowl that was half filled with water (I wanted the new plants to have moisture to encourage new growth). These will stay in the water for 2 days then I’ll remove and nurture them until the holiday season. I think I’ll wrap copper wire around the upper part of the cork, make a loop so that they can be hung up, or just sit on a window sill. If I do that I’ll take another photo and post it. A little desktop wallpaper for this fine Wednesday! Feel free to download – just click on the image and drag to your desktop. I love this Scottish saying! 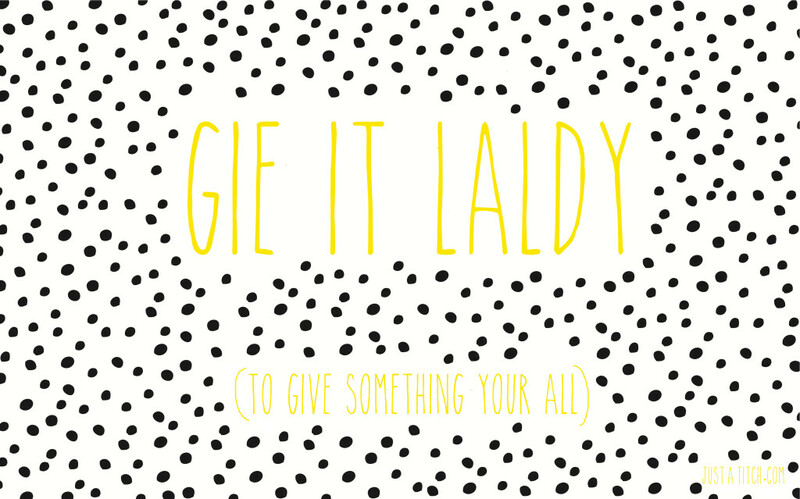 To give something laldy, whether it’s singing a song, running a race, or simply living life, means to put in 110% effort, give it your all, pull out all the stops, …and do so with great enthusiasm or gusto. This is a very basic recipe! 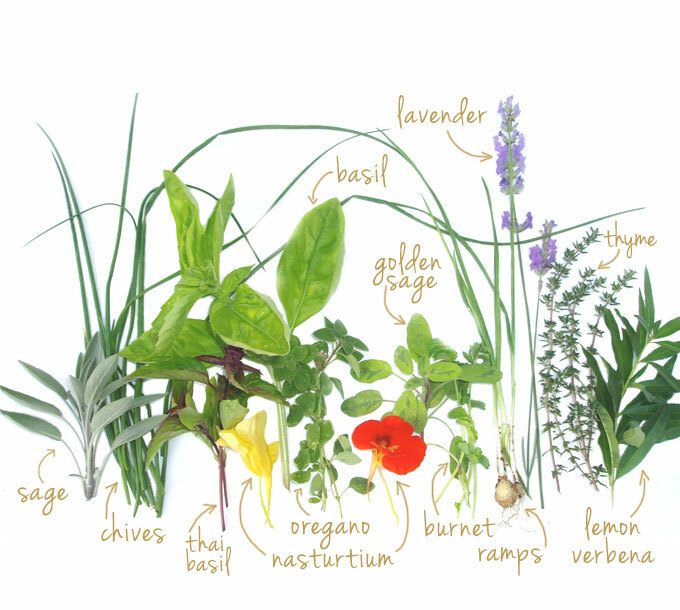 All you need is a handful of freshly picked herbs (I used chives, thyme, green basil, thai basil, lemon verbena, golden sage, greek oregano, garlic ramps, and burnet). -Toss the herbs with the hot pasta, drizzle the oil and vinegar mixture over the top, then sprinkle the flower petals with some lovely cheese to finish. Side note: I use two types of pasta: Wheat for my husband and gluten free for me. My favourite GF pasta is Tru Roots, Ancient Grain – Penne Pasta. If you know me, you know that I’m a sucker for tunics! I’ve been wearing dresses over jeans for eons. Blue Tunic: I finally discovered PODOLLS in San Francisco last year. Bonus – they make everything locally in San Francisco. I love everything about their blue tunic stripe shirt-dress. If only I could find my size! Sweater Tunic: I’m also a big fan of TOAST out of the UK. They’ve been designing clothes since I learned how to bookmark a web page. I finally got an inside glimpse to their daily life in the latest issue of Kinfolk. They are truly an inspiring couple! I’m loving this fragrance by Hermès – it’s a perfect ‘everyday’ perfume.